Penbontbren Boutique B&B01239 810248work Bed & BreakfastPenbontbren Luxury Bed and Breakfast in West Wales is nestled in 32 acres of grounds, surrounded by Welsh countryside with views towards the Preseli mountains and only 2 miles from wonderful national trust beaches. With 5 luxury suites to a 5 star standard, each with a spacious sitting room, their own garden, king size bed and sumptuous décor and furnishings. We are sure you will enjoy our accommodation and your stay at Penbontbren. Our substantial Welsh breakfasts are cooked using fresh wholesome ingredients. Fresh free range eggs with award winning sausages, local cured back bacon. We use all locally sourced ingredients. After a peaceful nights sleep start your day with our delicious breakfast. Set in the beautiful Welsh countryside there are plenty of historical villages to explore in the surrounding areas. 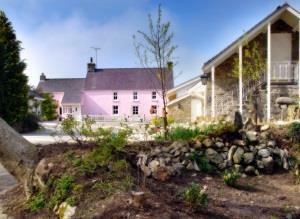 Our West Wales section of the website has details of lots of places to visit whilst enjoying your stay at Penbontbren. The grid shows the prices and daily availability from Thu 18 Apr 19 to Wed 24 Apr 19. It's easy to check availability for particular dates; just use the calendar to choose the check in date, select the number of nights and click the 'Search' button. Click the Book Now or Book Direct button to book the highlighted days. With Book Now the room booking will be confirmed immediately, with Book Direct the room reservation will be confirmed within 24 hours..
Penbontbren Luxury Bed and Breakfast in West Wales is nestled in 32 acres of grounds, surrounded by Welsh countryside with views towards the Preseli mountains and only 2 miles from wonderful national trust beaches. All room are full suites with their own separate sitting rooms and terrace garden through French doors, with views over the garden. Each room has a well stocked fridge (wine and fresh milk) and a each room has a coffee machine. Children welcome from any age. From the South of England take the M4 motorway all the way, across into Wales and continue towards Carmarthen. From Carmarthen take the A484 to Newcastle Emlyn. From Newcastle Emlyn take the B4333 for Aberporth. Turn right onto the A487, which is the main south to north coast road of Wales. Go north for approximately one mile to a village called Tanygroes, then take the 2nd right 1 mile after Tanygroes signposted Penbontbren. Travelling south from Aberystwyth on the A487, take the first left after Sarnau signposted Penbontbren.